Steve Schultz 's 1970 Chevelle SS. 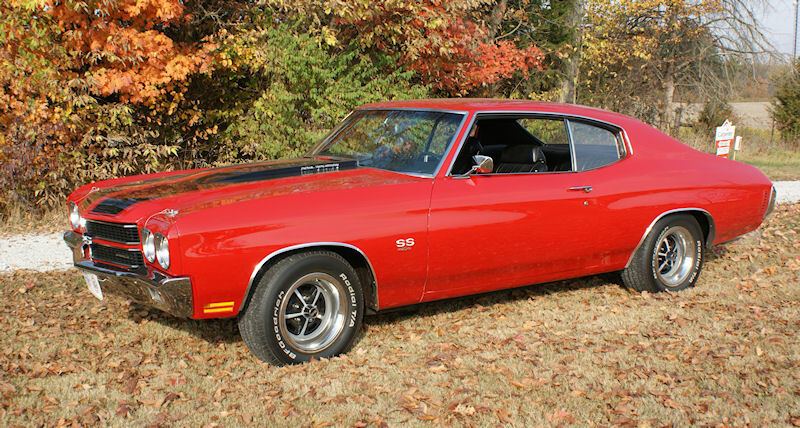 I always wanted a red 1970 Chevelle SS, but then again, so does a million other guys out there. After a few decades of dreaming, I finally began my search in 2003. I wanted a great driver and did not need a numbers matching combo, that was really the only way I could afford one at the time. After looking for about 2-3 years, I got very discouraged.I soon realized that there were more 454 SS's available than were actually made. I found so many clones people were trying to pass off as the real deal and quickly learned how to spot a fake build sheet. 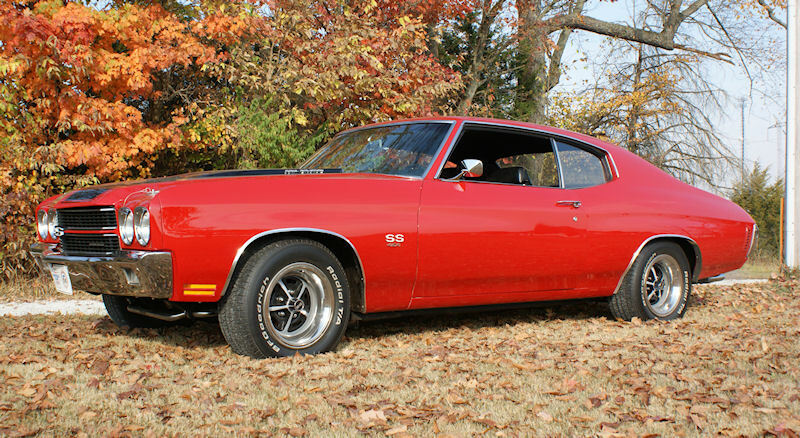 I wanted a Chevelle that coded out to be a "true" red car, not a green or yellow car that was repainted red. Although that would be fine, I just wanted one that coded out to be correct which was my preference.I needed a recent restoration because unlike most in the club, I am not a gear head, so I lack the mechanical aptitude to restore something myself. I finally came upon a red 1970 LS5 in Marina Del Rey California in early 2006. It was a seller working through a broker. The broker dealt with European exotics like Porsches and Ferraris, so this American muscle car didn't really fit with his inventory. After speaking with the broker on a Thursday, they had all the right answers for me. After sleeping on it, I decided to fly out and look at it, so I called the guy back on Friday. I was sickened to learn that it was being sold to someone local. Not quick enough once again, story of my life. Now for whatever reason, the broker kept my number. Their buyer wanted to be financed and although approved, he did not want their financing and wanted to search for 2-3% auto financing on his own which was unheard of. Come the following Tuesday when the guy had not come up with financing, the broker called and explained this to me and said he considered the car available for sale once again. He said if I were to come look at it, he could guarantee I would buy it - a pretty bold statement. I explained I could not get there until Friday, he said okay, hopefully it would still be available. After hanging up with him, I decided not to wait and rearranged all my meetings for Weds. I called him back an hour later and said I would be there tomorrow. Wednesday rolls around and just before I am ready to board the plane to California, I figure I should call this guy back and make sure nothing has changed. Upon speaking to him, he said the original buyer had shown up and now had cash in hand. My heart sank once again until he said "I told the guy he was now second in line to a guy in Arizona, so the guy from Arizona has first crack at it. If he does not buy it, you can have it.". I will have to say, I was astonished by this. Most dealers and brokers I have ever dealt with would have sold their mother if cash was waved in their face. Anyhow, I fly and get there and the car is everything he said it was. After an inspection and test drive, I bought it on the spot after still being able to negotiate it down to where I wanted to be at. I flew back to Arizona and drove with a trailer to California a few days later on a Friday and picked it up. As the story goes, this car was purchased to race in 1970. The original LS5 blew up in 1971 and the car sat for 17 years before being resurrected in 1988. By that time, the LS5 was long gone. The most recent restoration occurred in 2005.It has a 425 hp 454 and a 4-speed M22 Transmission. When I ran it on the dyno, it ran 425 hp on the nose and put out 470 ft/lbs of torque. All documentation shows it to always be a southwest car, but it was purchased new at a Chevy dealer in Franklin, Indiana in 1970. The build sheet does show that it was an LS5 car, but was originally an automatic. My mechanic in Arizona confirmed that the build sheet is correct and that it was originally an automatic car. The car itself has only 63,000 original miles. The Chevelle could probably use some restoration in a few areas (trunk, engine bay and paint), but it is fine for me. Mechanically solid and fun to drive. I have jumped in this car and driven it 400-500 miles without a second thought on many weekend trips in the Arizona heat and it now resides in Indiana. This Chevelle never runs above 190. This is the best form of investment that a person can enjoy for years to come. I know I have.